Since I have been writing about using repurposed wood or metal scraps, I thought this was as good a time as any to share an old woodworking project of mine using red oak cutoffs that were headed for the trash bin. Whether you are working with wood, metal, or even plastic, you can usually salvage good building materials from scrap piles. Instead of tossing wood scraps into the trash bin, you might might find it enjoyable designing and crafting some useful new product from the leftovers. Depending on what kind of materials you have, the possibilities seem unlimited, from checkerboards to jewelry boxes, from rocking horses to toys, and from storage boxes to art. Most any wood or metal material might be used, independently or in some artistic combination. Just make sure you have the tools you will need for finishing your job. Otherwise, your scrap creation might become nothing more than an idle pile of scraps gathering dust. Quality counts when it comes to salvaged materials. It is usually best to avoid wood with splinters, extreme warps, rot, or fractures. As for metals, rust is bad, unless it happens to be part of an armistice treatment — a sculpture, for instance. Iron (or steel) rusting is an example of corrosion — an electrochemical process. 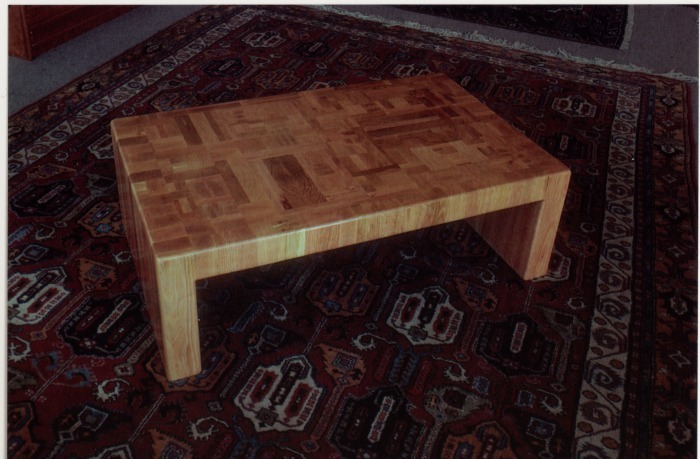 In this article, I show a coffee table I built using different-sized red oak cutoffs I had saved in a scrap pile during the remodel of an interior study. Hardwood not only takes many years to grow before harvesting, it also comes with a very expensive price point. Clean off all excess wood glue with a wet rag after you laminate and clamp pieces together. Wood glue is a water-based product, so it will clean easily. When clamped with pressure, the wood joints are remarkably strong. Wood glue will set in one hour and is considered cured after 24 hours. Exposure to excess water or flooding, however, will impair your strong joints. Dried excess glue can also be removed by sanding. Because the finished product uses squared or rectangular components, it was important to initially trim all scrap wood into pieces with squared edges on all grain surfaces. This makes for easy gluing and clamping as I began to expand my structure. It’s important to have plenty of clamps available. A project like this usually turns out to be a labor of love, demanding and excessive amount of patience and time. When you have finished, however, it will all seem worth the effort.